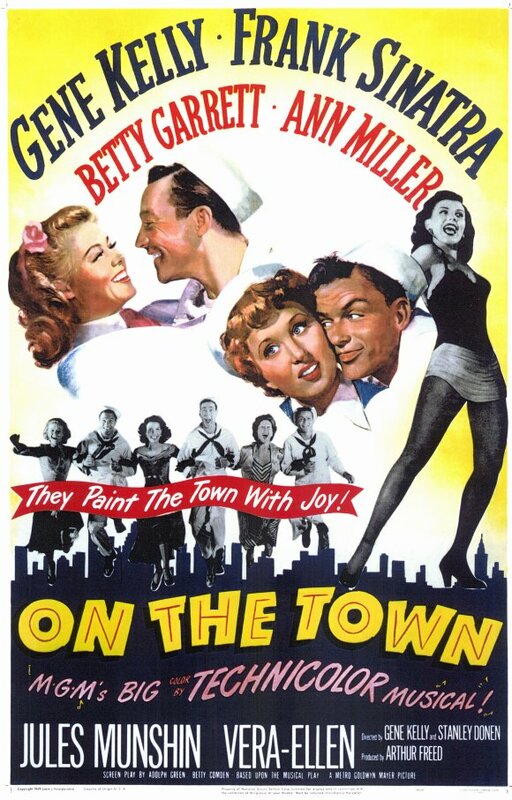 "On The Town" from MGM Studios in 1949 is a lovely musical with an amazing cast! 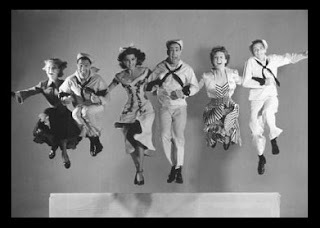 Starring: Gene Kelly, Frank Sinatra, Ann Miller, Vera Ellen, Betty Garrett & Jules Munshin. A tale of three sailors on a 24 hour leave in New York City and they hillarious time they have before going back to on board, as they sing, "New York, New York, What a Wonderful Town!" 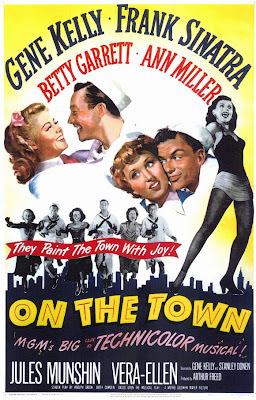 tagline: "They paint the town with joy!" First MGM musical to film scenes in NYC on actual location and not fully on a studio lot. Prior to being a successful film it was a huge play on Broadway with music by Leonard Bernstein and lyrics by Betty Comden and Adolph Green proved to be a lovely trio for this musical production. 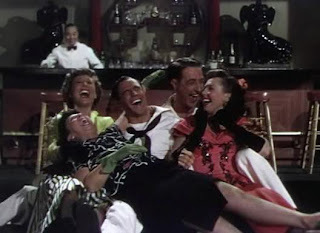 Gene Kelly directed the musical sequences of this film. 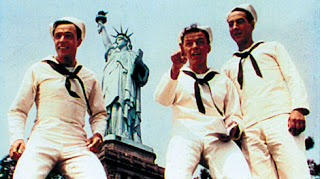 Gabey (Kelly), Chip (Sinatra) and Ozzie (Munshin) - three sailors on a 24 hour leave in NYC are "on the town" to see the sites including lovely dames. Each sets sites at various places on lovely ladies. 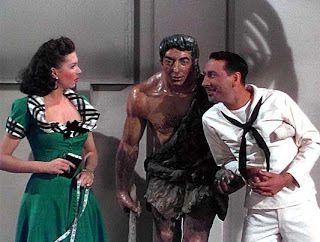 All three men take a trip on the subway and Gabey meets the lovely "Miss Turnstiles of the Month" Ivy Smith (Ellen). Gabey thinks that Ivy is a high class society lady where in fact she is from the small midwestern town he is from. While in the Big Apple they meet a hillarious cab driver named Brunhilde (Garrett) whom sings a rousing song, "Come Up To My Place!" and is determined to get her hands on Chip! 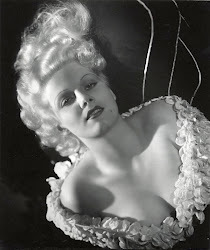 Ivy has to leave for work and will meet later (hopefully) and then it is off to the Museum of Natural History for the three men. They now meet the very vivacious Claire whom is doing research on prehistoric man and sets her eyes on Ozzie. 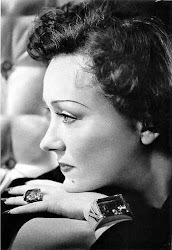 Now all three men have a dame to go out on the town with though Ivy proves to be a challange to find again and is secretive of her true identity of not being such the socialite they three men think she is. All have a great night in the Big Apple with going to various night clubs and dancing the night away! 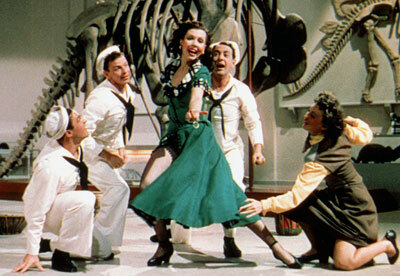 This film has many lovely dance sequences that are a not to miss! Lovely dance sequences to see: "Prehistoric Man" "On The Town" "Count on Me" & "A Day in New York"